Both of these are just plain fun in a word-nerdy, language-loving way. 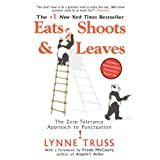 Yes, Eats, Shoots, and Leaves is filled with hilarious examples of poor punctuation. Generally, I'm too busy chuckling to realize I'm also learning something. I heard the joke about the panda years ago, but that only made me happier to pick up the book. Who doesn't need more books with grammar-loving pandas on the cover? Prolix is a treat, too. Don't get me wrong, I enjoy other word games, but sometimes piecing together tiny words feels limiting. The first time I played Prolix, I got to score "derivatives." Ah, that calculus class did me some good! 18 points! The game description sums it up pretty nicely. I love the interrupt game mechanic. Even if it's not my turn, I still need to wrap my head around the letters, so there's no down time waiting for someone else to finish up. I'm always engaged. As a bonus, there's also a challenging set of rules for solo play. The only downside of the solo game is that my husband doesn't look impressed when I tell him I won (he should; it was hard). 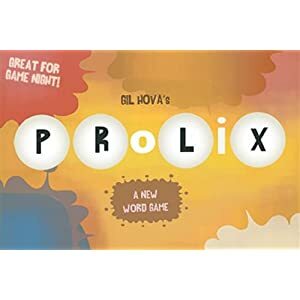 Prolix sounds perfect for my wife and me; I'll keep an eye out for it.